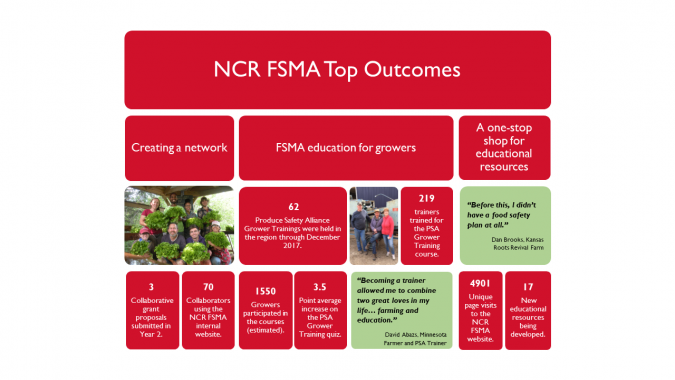 As part of the National Collaborative initiative, NCR FSMA is tasked with developing national success stories related to FSMA in partnership with the Lead Regional Center and the Northeast Regional Center. Regardless of where you are in the country, we are seeking your help to develop these success stories. For some growers, the Produce Safety Alliance (PSA) Grower Training is their first introduction to the resources that are available to fruit and vegetable growers through Extension. Farmers are learning that the new Food Safety Modernization Act (FSMA) Produce Safety Rule is not a burden, as they expected. Mike Buske has been growing vegetables commercially for nearly 20 years. While he admits that the idea of the government regulations could take the fun out of farming, so far FSMA has not been a burden. “As long as they keep the rules reasonable, it shouldn’t cost much more than what we’re doing,” he said. 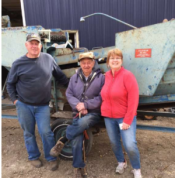 Jamerson held a review at their farm, and a few other farmers attended as well. As a result, Brooks and Mai immediately made some changes to improve their food safety practices. “I stopped washing my greens,” says Brooks. Previously, they had washed salad greens and spinach in a bin of water and then spun them dry. During the on-farm review, they learned that washing their greens using the same tub of water can spread contamination. Jamerson suggested that they sell their greens unwashed, if possible, or rinse them over a grate. In this way, water washes through, so that if something is contaminated it does not contaminate the whole bin. The first face-to-face gathering held for partners of the North Central Region Center for FSMA Training, Extension, and Technical Assistance (NCR FSMA) was a grassroots effort organized by two prominent partners: Phil Tocco (Michigan State University Extension) and Don Stoeckel (Produce Safety Alliance). During the summer off-season, new information about the Produce Safety Rule was released, and teams had time to develop new classroom activities to do a better job of educating growers.